Arthurian fantasy, published by Uncial Press. 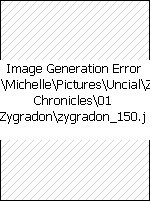 Zygradon: A bowl of magic, connecting all the threads of magic throughout the world. Three Drops of Blood: Three children born to the Warhawk: One shall suffer, one shall wait, and one shall abominate. Lady Warhawk: The battle for Lygroes plunges the world into war, and separates the magical continent of Lygroes from the rest of the world behind a magical shield. The Warhawk sleeps, awaiting the day when he will return to battle one last time. The Rift War: The modern world and the ancient world must reunite as the traitor, Edrout, prepares to destroy everything the Warhawk has fought for. Prophecy awaits final fulfillment. Child of Blood or Child of Life, both born in a fierce winter storm. Mrillis was orphaned in a battle against the Nameless One, the most evil enchanter the World had ever known. Raised by the most powerful Rey’kill enchanter of their time, Mrillis and Ceera grew up as brother and sister, and discovered their destinies and magical talents – and knew they would always be together. When the Nameless One targeted Mrillis, to either destroy him or turn him into the Child of Blood, all the armies of the World joined together to defeat him. He left three children, Three Drops of Blood, according to prophecy. The oldest, a boy, became Mrillis’ friend. Endor, Mrillis and Ceera grew up together, exploring their talent, learning their destinies, and fighting to find a cure from the ravages of star-metal that poisoned their world. Almost by accident, Ceera attempted to use star-metal as metal, and tame it. And from her hammer, the Zygradon was born, to harness all the magic of star-metal in the world. A new enemy arises to challenge Mrillis and Ceera as they battle plagues, an unknown enemy and treachery within the Noveni and Rey'kil alliance. Has the Nameless One survived, or has someone else taken his power? Endor's sister, Triska, is Ceera's heir as Queen of Snows, but arrogant and temperamental. Are they what they seem, or something else, something dangerous? During a star-shower, Ceera has a vision of the star-metal sword. 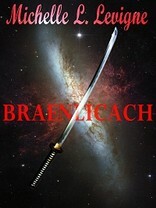 She brings together the surviving makers of the Zygradon to forge the sword, Braenlicach. The children of the makers of Zygradon and Braenlicach inherit their parents' links with the magical objects. Uneasy years of peace pass, as they mature. Plagues return, and the young guardians take Zygradon out to heal their land, but they are betrayed from within. Traitors within the Stronghold attack, wantonly killing those linked to bowl and sword. Mrillis is left to save his world, but in doing so, may lose all that he loves.